The Magic Yarn Ball: DONE! 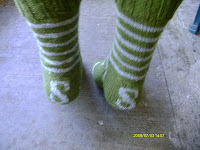 I am finally done with my Such a Slytherin socks; and only after a few threats and banishment into dark corners of the room. I feel accomplished. Now I'm working on a pair of for my sister. 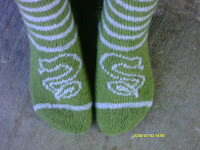 This pair is not only slightly smaller (I've taken out 4 stitches), but because I don't have enough for an identical pair, she'll get what is basically the negative of the sock (mainly silver, with the 'S' and Snake in green). Also, I didn't do the snake in intarsia...I realized that I'm not that insane after all.